Queen Alexandra’s Royal Army Nursing Corps (QARANC) nurses have worked at the sharp end of military life since the days of Florence Nightingale. Nurses, Student Nurses and Healthcare Assistants of the QARANC deliver high quality, adaptable and dedicated nursing care wherever the Army needs it. Caroline is an Army Nurse in the QARANC and it wasn’t until she got to Sandhurst to start her officer training that she realised quite how useful achieving her Bronze and Silver Duke of Edinburgh’s Award (DofE) was going to be. From week one, her platoon were being tasked with problem solving, route planning and navigation. These were all skills that Caroline felt she was able to do at a high standard because seven years before, she had navigated her way across the Peak District, developing her problem solving and navigation skills as part of her DofE programme. Being an Army Nurse requires good time management, communication and most importantly, teamwork skills. When Caroline was doing her DofE, she developed all of these skills and realised the importance of valuing every member in the team and their opinions. This has massively helped her to excel in her career, and work better with others. Unfortunately, while at Sandhurst, Caroline sustained an injury and had to put her training on hold, two weeks before her passing out ceremony. Although it hasn’t stopped her – Caroline is now using her recovery time to help recruit people for the Army Medical Services, encouraging young people to start their journey in the Army as a healthcare professional. “The Duke of Edinburgh’s Award gives young people the opportunity to step up and really take on responsibility at a young age. It gives you an edge and allows you to focus on new and exciting activities that you may not have tried before. 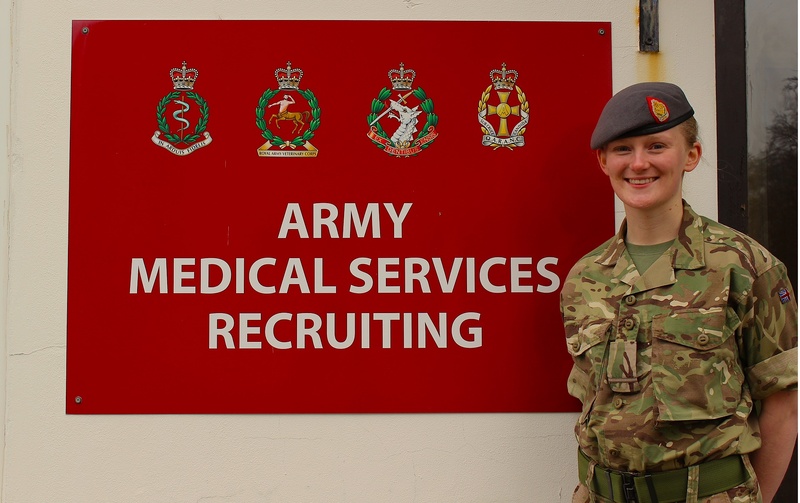 “The skills I’ve taken from DofE have really helped me throughout my career as an Army Nurse and will continue to do so. Its enabled me to adapt in situations, problem solve, lead a group and most importantly, time manage.